Earlier in the month, media outlets reported on an unusual Christmas tree at a Palestinian university in east Jerusalem. 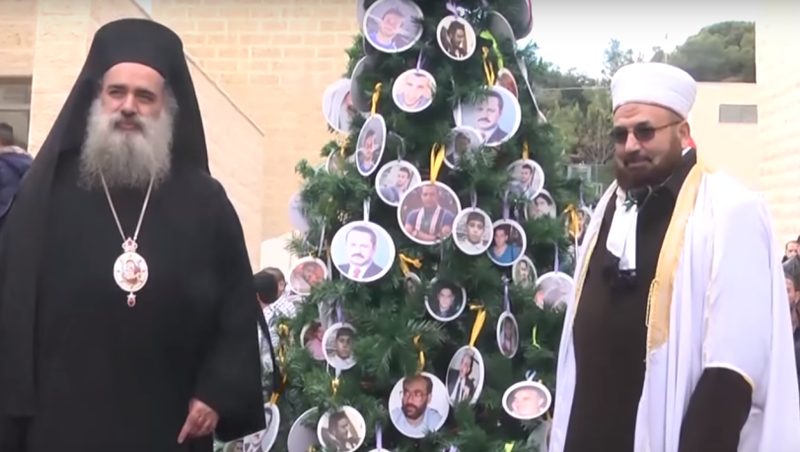 To mark the beginning of the holiday season, Al-Quds University has unveiled a “nationalist Christmas tree” — resembling a traditional Christmas tree, but decorated with pictures of Palestinians killed by Israel. The fir features dozens of photos of “martyrs,” including Mohammed ِِِِِِAbu Khdeir, a teen burned to death by Jewish extremists in 2014, as well as prominent Palestinian terrorists killed carrying out attacks against Israelis over the past few months. One of these, whose picture appears hanging multiple times on the tree, is Fadi Aloon who was shot and killed by police in early October when stabbing an Israeli teen outside Jerusalem’s Old City. The Telegraph, in a Dec. 25th story, by Raf Sanchez, arguing that putatively positive relations between Muslims and Christians in the Palestinian territories represent ‘solidarity against the occupation’, noted the martyr-themed Christmas tree in the following passage. There are limits, however. Students at al-Quds University [at the east Jerusalem Abu Dis campus] were reprimanded when they decorated a Christmas tree with the images of young Palestinian “martyrs” who were killed trying to attack Israelis during this latest wave of violence. 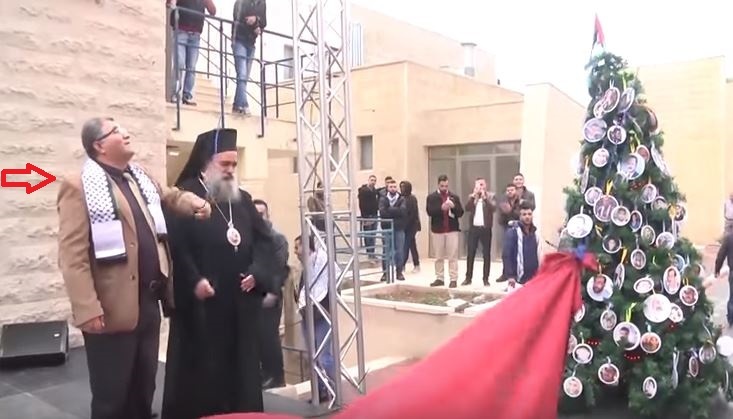 However, Sanchez’s claim that the students responsible for the martyr-themed Christmas tree were “reprimanded” seems quite questionable in light of reports that the tree was revealed during an official event attended by a host of university officials, including the university president himself, Imad Abu Kishk. Here’s a snapshot of from a video of the event. Abu Kishk is on the left. You can see the president taking part in the ceremony revealing the martyr-themed tree – among other examples of radicalism at the event – in this video. The president’s attendance at the official ceremony makes it extremely unlikely that the tree was even remotely controversial at the university, yet alone representing a row which resulted in a student reprimand. Indeed, the campus has been long been compromised by such extremism. In 2014, a pro-Hamas rally was held on campus. Additionally, a “Nazi-style demonstration” was held by students affiliated with Islamic Jihad on the same campus in 2013. We’ve contacted Telegraph editors and tweeted the journalist asking for a source for the claim that the students were reprehended, and will update this post if we get a response. How many times? It is not ‘Palestinian’. I’m usually not in favor of settlers burning trees, but that tree should definitely be an exception. Some universities promote science and art. Some put up trees with pictures of murderers. film-making (for a career in Palliwood). and of course this year’s favorite: kitchen knife technology and application. The tree in the second photo appears to be falling over (to the left), rather like those pictured on it and the terrorists they symbolise.